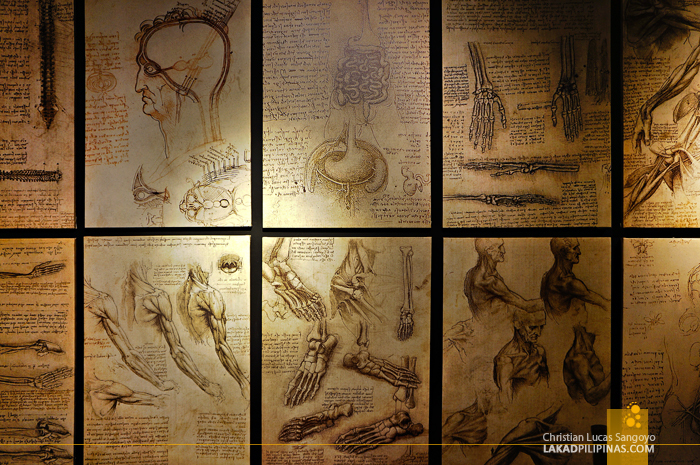 History nuts and art lovers know that Leonardo Da Vinci is a genius. But this brilliance is lost among the multitudes of ordinary people who probably only knew the famed renaissance artist only by his cryptic masterpieces, the Last Supper and Mona Lisa. Enter Dan Brown’s controversial bestselling book, The Da Vinci Code, and the genius of Da Vinci is once again brought back to the masses. 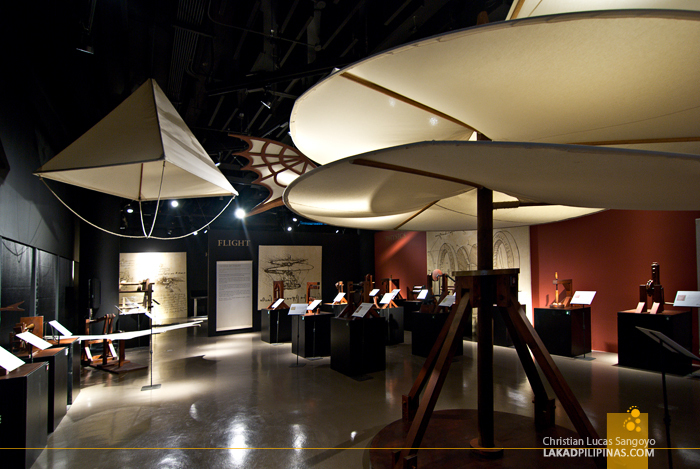 And through the month of first day of September to the last of November, The Mind Museum in cooperation with France’s Grande Exhibitions and The Anthropos Associ is peeling off more of the mysteries surrounding the wonders behind Da Vinci’s brilliant mind by bringing in a world renowned exhibit; Da Vinci The Genius. 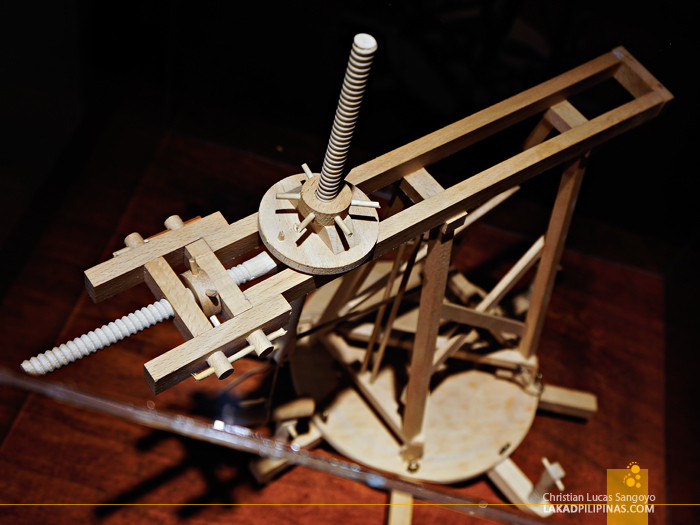 Billed as the most comprehensive exhibit on the life of Leonardo Da Vinci, the gallery features life-sized and miniaturized wooden replicas recreated from Da Vinci’s very own cryptic codices or notebooks. And of course, reproductions of his most famous paintings are also available for public viewing. 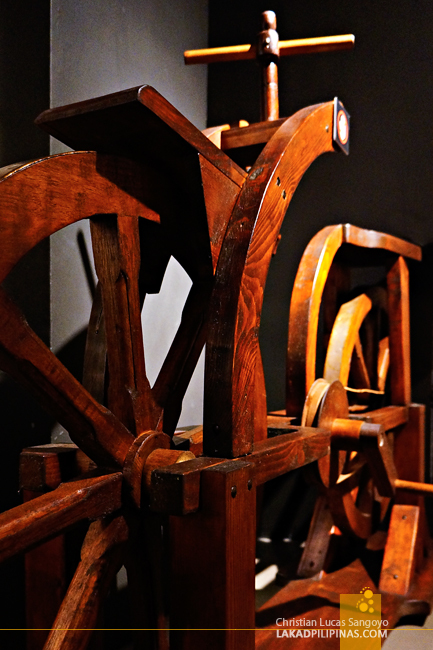 Before The Mind Museum opened the exhibit to the masses, I was lucky enough to have a preview of Da Vinci’s genius. I have to be honest though, before The Da Vinci Code, I was as ignorant of Da Vinci’s impressive body of work as the next guy. Shameful, considering I have a diploma in Architecture. 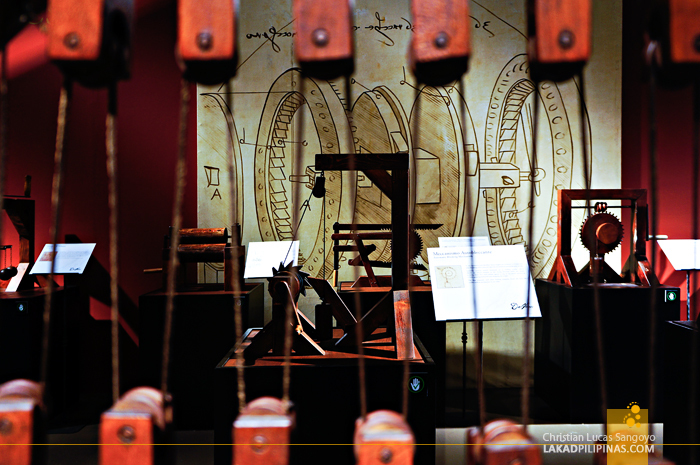 The Mind Museum’s Da Vinci The Genius is a guideless exhibit. One can wander about on his own at any given time and even backtrack to previous exhibit rooms if one wishes to. To fully appreciate the tour, one has to read; and read a lot. All of the exhibits have a short but concise descriptions attached, but if you need further information, the museum provides personnel dressed like druids who would be more than happy to answer your queries. 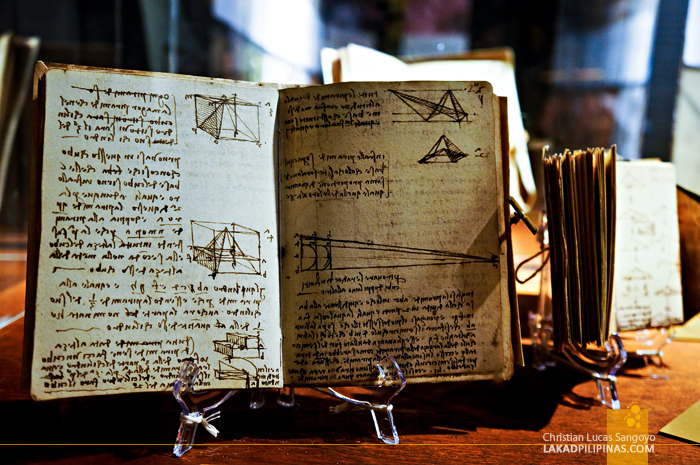 All of these wouldn’t have been possible though if not for the Da Vinci codices; a series of small notebooks created by the Genius himself throughout his lifetime. There are illustrations and notes ranging from a host of topics, from the arts to the sciences, but the trouble is they’re written in code—or to be more precise, backwards. Da Vinci must be quite paranoid with his thoughts jotted down. The Da Vinci The Genius exhibit is housed inside The Mind Museum’s rotating gallery. It features hundreds of replicas and quite a handful of paintings and illustrations subdivided into nine areas delving into his designs in military engineering, music and optical subjects, renaissance art, hydraulic and aquatic appurtenances, physics, theories on flight, civil engineering, the human anatomy and his cryptic codices. 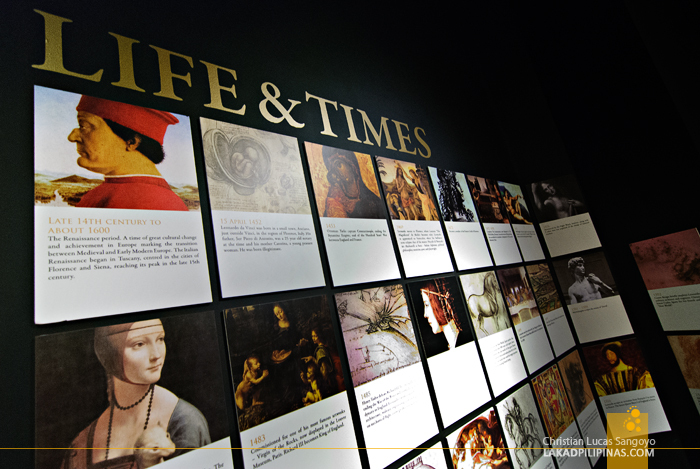 What’s really nice about the life-sized exhibits, which were copiously made by Italian artisans from the Da Vinci’s codices and constructed from materials available during the period, is that most of them are interactive. Guest can actually touch and even try to operate them, which is a big no-no in most museums. 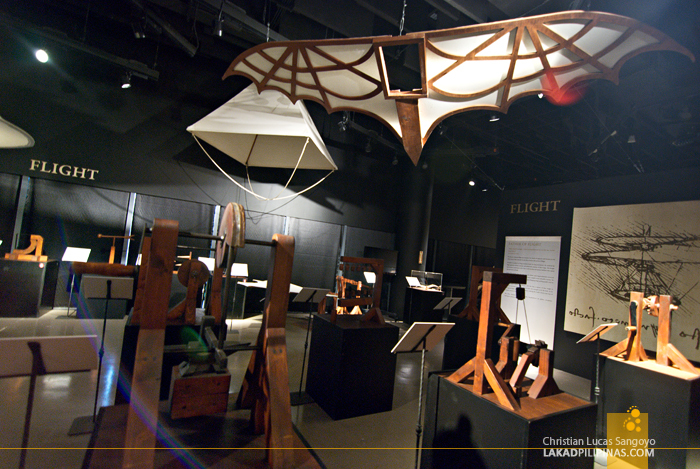 It was surprising to find facets of Da Vinci that most people hardly know about. For example, he devised musical instruments, I didn’t know that. He produced diving apparatuses and even conceptualized submarines made for war, I definitely didn’t know that. His military genius in fact encompassed more than that attack submarine, which he kept secret by the way, not wanting the war from becoming as devastating as it already was back then. 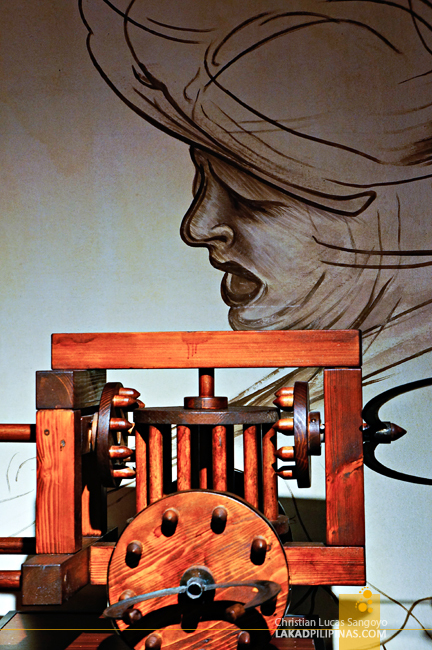 I’m actually confused by this as Da Vinci designed quite a number of war machines for patrons like the Duke of Milan. Like this war chariot named Carro Falciante (Mowing Wagon) designed for the same Duke in 1485. It’s a chariot from hell complete with multiple whirling scythes from all its sides. But what would really get you are the humongous four-bladed scythes installed in front of the horses. Really horrific, especially if you’re on the receiving end of that charge. And there are his artworks. Most of his famous ones (or infamous if you must) are reproduced in the exhibition in actual sizes; his Lady with an Ermine, Virgin of the Rocks, Annunciation, Madonna Litta to name a few. 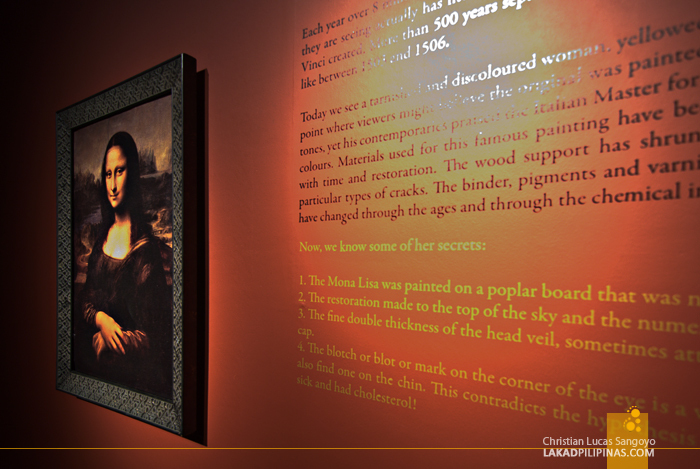 And of course, the Mona Lisa is also featured, along with her secrets. 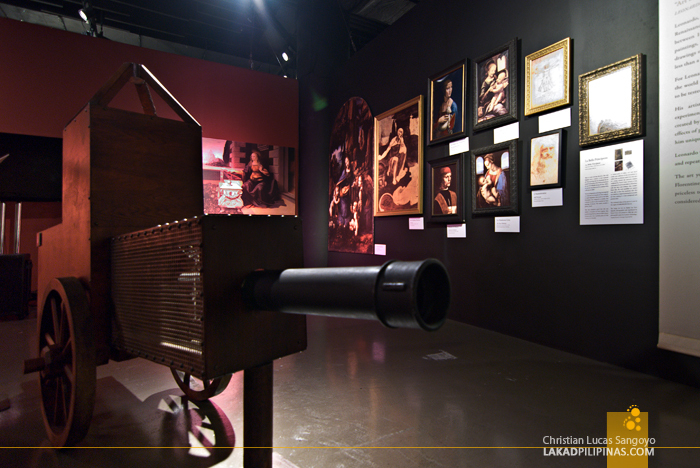 A film documentary on the life and times of Leonardo da Vinci is also available for visitors in the Mind Museum’s mini-theater. 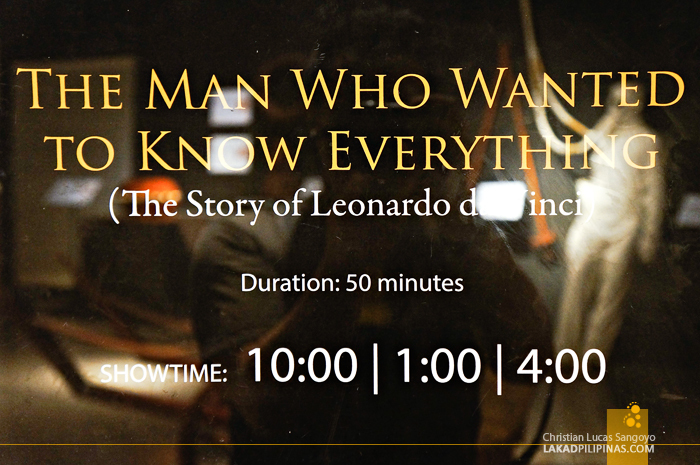 Titled The Man Who Wanted to Know Everything, it has three screenings everyday and runs almost an hour long. 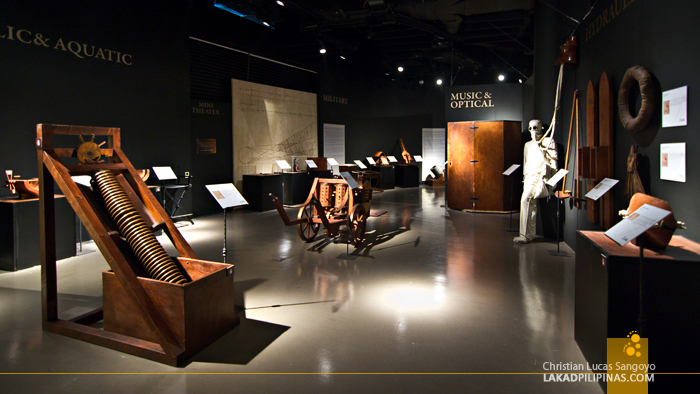 But the piece I feel would be most popular to guests is located inside the Music and Optical section of the exhibit, the Stanza Degli Specchi (Mirrors Room). It’s an eight-sided room with eight flat mirros as walls. 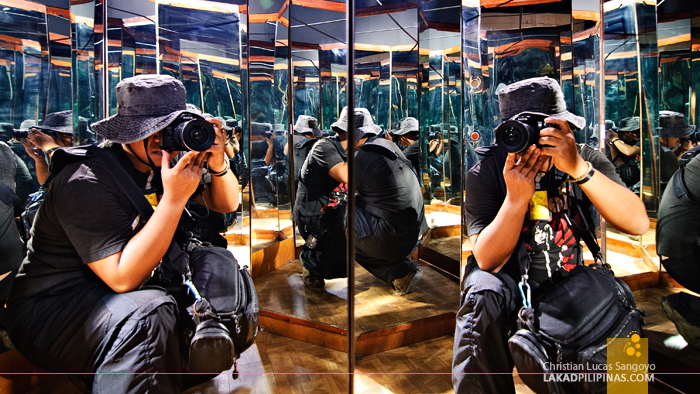 Da Vinci said that if a person stood inside, he will be able to see every part (of himself) endless times. Perfect for selfies! 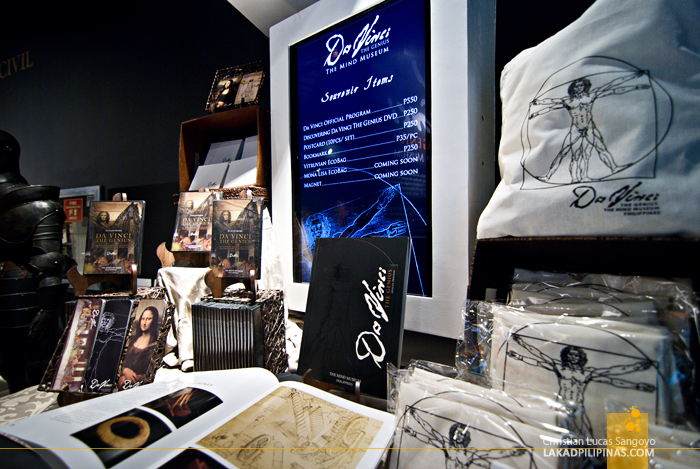 Before exiting, we saw some of the souvenirs available for sale at the lobby of the Da Vinci Exhibit. They have books, DVD’s, magnets, eco bags and what-nots inscribed with all sorts of sketches by the genius. The cheapest ones were the bookmarks at Php35.00 each while the most expensive is the beautifully printed Da Vinci Official Program which is being sold at Php550.00 each. Expensive stuff! 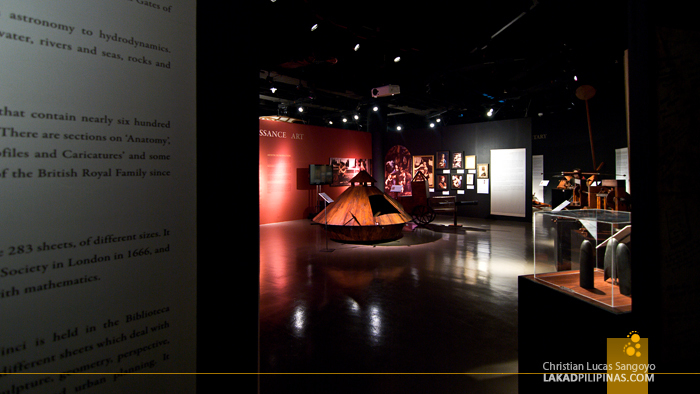 I immensely enjoyed the brief tour The Mind Museum gave us about the legend that is Leonardo Da Vinci. There were still a few exhibits that we weren’t able to see, like the 3D presentations of the Mona Lisa, the Last Supper and the Vitruvian Man; but even with that, I was really impressed with the exhibit. It simply felt authentic and I probably would’ve spent hours on end reading everything and tinkering with the replicas if given more time. 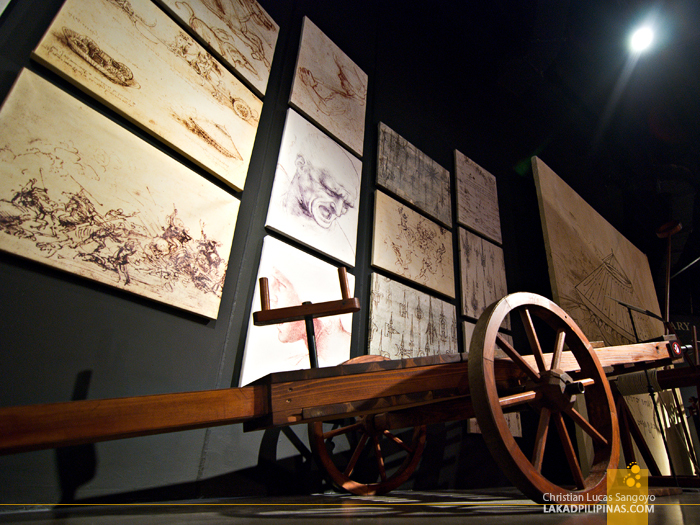 I highly recommend The Mind Museum’s Da Vinci The Genius especially for history buffs, geeks, artsy types and even to people like myself who only got to know Da Vinci through Dan Brown’s infamous book. 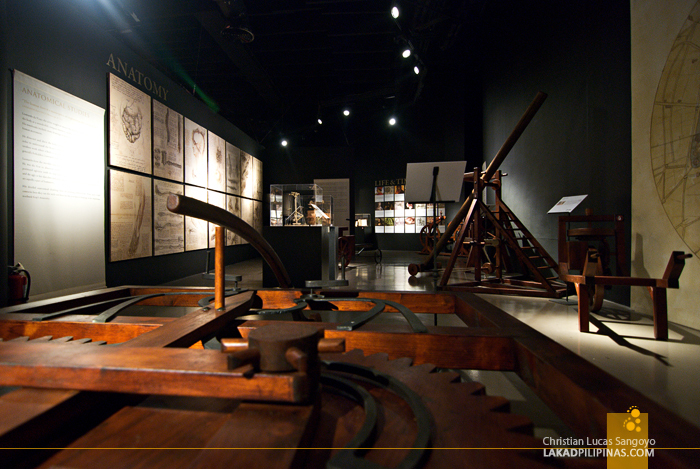 I say, do yourselves a favor, visit the Mind Museum one of these days and get to know the genius that was Leonardo da Vinci.